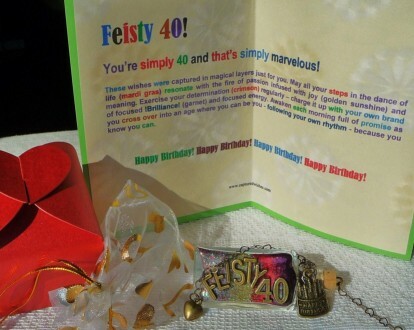 Unique 40th birthday gifts reflect the fact that a 40th birthday is a very special occasion. It is a reason for celebrating those who are dear to us and to wish them blessings for the year to come. Every birthday is cause for gift-giving, as each year in the life of someone we care about is a very precious thing indeed. Some birthdays, however, seem to weigh more heavily and carry more importance. We call them milestone birthdays. When we've reached a certain age, achieved a new station in life, or encountered some new rite of passage, it seems fitting to mark the day with a celebration - along with a unique 40th birthday gift or gesture that is especially meaningful and memorable. The 40th birthday is definitely one of those extra-special occasions that calls for a unique and sentimental gift. By age 40, we have experienced much and have hopefully become more comfortable with who we are than we were in past decades. Forty is often an age where we finally decide to shed old insecurities and inhibitions, and focus more on the importance of health, friendship, and inner happiness than on looks or social status. Often, 40 is the age at which we finally begin to appreciate what is truly important in life. It is also a birthday on which many people tend to reflect on their life - on where they have been, where they are, and what they envision for their future. A 40th birthday party can go a lot of different ways depending on the personalities of those involved. A light hearted, jovial person will probably appreciate the humor in an "over the hill" themed party while others will appreciate a more straightforward celebration. Forty is kind of a big deal, and whether it's a backyard barbecue or an elaborately planned trip overseas, the occasion should be celebrated in style and with great enthusiasm. Beyond the Party: Unique 40th Birthday Gifts should stand out and make a statement. Planning a party is one thing, but picking out a unique 40th birthday gift for your 40-year-old friend is more easily said than done. Finding something that is both meaningful and unique is no easy feat, and you don't want to default to a less-than-amazing gift at the last minute because you still haven't found anything. In these situations, it's an easy fix to simply pick up a gift card for a restaurant or jump online and order some flowers. However, gift cards and flowers - no matter how graciously they are received - say nothing about the unique relationship between you and the recipient of your gift. Nor do they have any real staying power in terms of being memorable or physically durable. Why not surprise them with a Captured Wishes gift? For that 40-year-old who thinks they already have everything, a Captured Wishes will be a welcome surprise. A tiny glass bottle filled with loving wishes in the form of symbolically colored "magic dust" and perfectly placed charms, the gift of a Captured Wishes is a beautiful work of art imbued with more meaning than any card or engraved piece of jewelry could ever hope to have. Every single Captured Wishes vessel made is absolutely a unique 40th birthday gift. 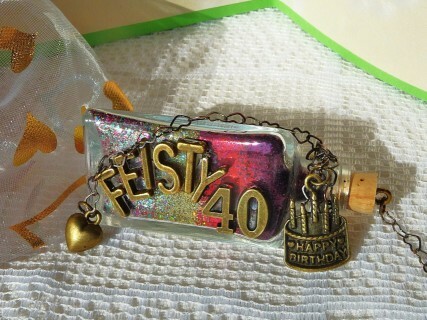 With a growing collection of these one-of-a-kind works, you'll surely find the wishes you want to bestow upon your best friend or loved one on their 40th birthday. They are waiting patiently within the Captured Wishes vessel that is designed just for this important life event. When all that's left of the occasion are the snapshots, a Captured Wishes vessel will endure - keeping alive both the memory of the day along with your sincere birthday well-wishes.